In 1964 the Auto Club opened in Century City. They left in 1994 but returned on October 3rd of this year. This is the Automobile Club of Southern California’s West Los Angeles branch, that is now located at 1950 Century Park East. The office serves nearly 90,000 Auto Club members living and working in Beverly Hills, Century City, West Los Angeles and other surrounding communities. “We constantly evaluate how to better serve our members and the relative locations of our branches, and this move will allow the Auto Club to be more easily accessible to a greater number of members in the area,” said Pamela Shepherd, the Auto Club’s vice president for branch operations. 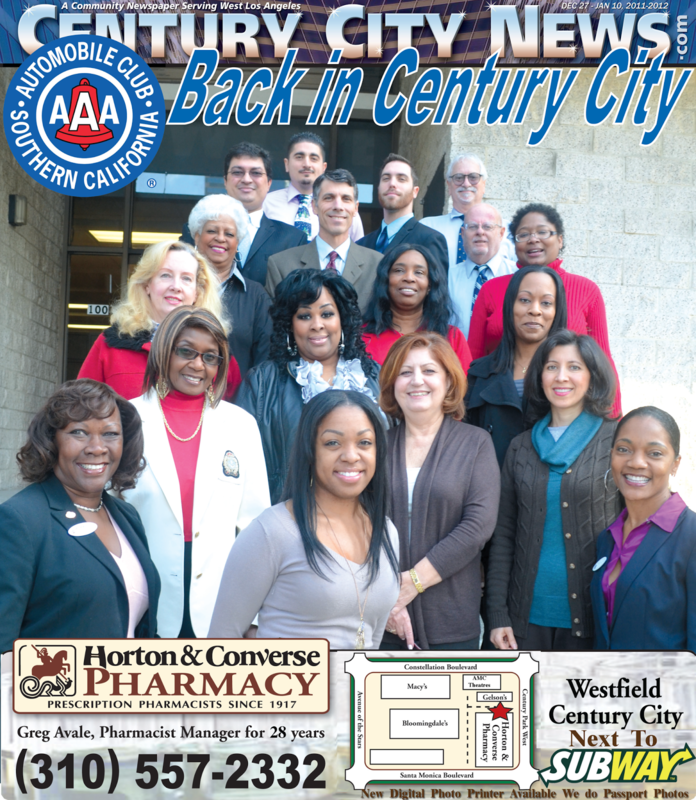 In addition to the relocated Century City branch, members in the West Los Angeles area can choose to visit Auto Club branches in Santa Monica at 2730 Santa Monica Blvd. ; Culver City at 4512 Sepulveda Blvd. ; or West Hollywood at 7100 Santa Monica Blvd. For a complete list of Auto Club branches, visit AAA.com/branches. The Century City branch offers insurance, travel and automotive services, as well as most vehicle-related DMV transactions. Office hours are 9 a.m. to 5 p.m. Monday through Friday. The phone number is unchanged at (310) 914-8500, and the branch manager is Michelle Gonsalves. For access to Auto Club services (except DMV) at any hour, residents can visit AAA.com. Auto Club members and the public can use AAA Travel agency services at the Century City branch to plan tours and cruises, make worldwide and domestic airline reservations, book hotels and car rentals and obtain rail tickets and foreign currency. International travel services include passport, visa and customs information; low-cost passport photos; International Driver’s Permits and Mexico automobile insurance. Members receive special travel benefits and discounts, including complimentary TourBooks®, TripTiks®, and maps for auto travel. The branch also includes experienced insurance sales professionals who can provide auto, watercraft, homeowners, life, umbrella, collector car and renter’s insurance services, according to Insurance Business Manager Tracy Williams-Bellard. Feel free to reach out and welcome them back to Century City.